When the weather turns warm and our thoughts turn to outdoor activities, I like to take some time to make sure our winter vacation plans are taking shape. One of our favorite spots during colder months is southern Nevada and the Las Vegas area. There are many things to do for the entire family but my husband and I like to visit there on our own as well. Last December was one of these times. We decided to visit during the National Finals Rodeo, even though we didn’t have tickets since there are so many things to do during that time. We stayed at the Renaissance Hotel so we could walk over to the convention center, home of Cowboy Christmas. Since I am a Marriott Rewards Platinum Elite member, we were able to enjoy the benefits of their concierge lounge. It was nice to have breakfast each morning plus appetizers and desserts in the evenings. One of the great things about rodeo week in Vegas is the number of places you can take in the action on a big screen. We became regulars at the Golden Nugget downtown where the crowd got larger and more ‘into’ the competition as the week went on. The Nugget was a great place for us to hang out since they had some terrific concerts that started right after the rodeo performance. 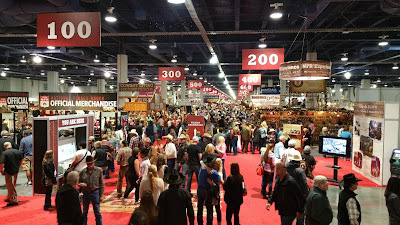 I grew up on country and hubby is a fan so rodeo week in Vegas made us feel like kids in a candy store. To kick off the week, we went to the Downtown Hoedown on Freemont Street. That was a lot of fun. Even the Viva Vision light show was themed for the WNFR. We took in concerts by the talented Reba, Brooks & Dunn, Tanya Tucker, Big & Rich, Trace Adkins, and Terry Clark during the week too. And our vacation fun didn’t stop with the evening entertainment. There are so many things to do in the Las Vegas area it’s tough to get them all in on one trip by we made a good effort. Driving out of the city during the day, we visited the ghost town of Rhyolite. Walking down the main street, you can almost feel what the town must have been like in its heyday. Looking across from the remains of the school, you can see right through the eerie skeleton of the general store at a rather small, unassuming adobe building. Checking the guide map we realized this was the last brothel standing in the town. It seems the larger properties had succumbed to the elements years before but this sturdy little shack remains. A testimonial to the seedier side of town. While in Rhyolite, we also visited the Goldwell Open Air Museum. My favorite sculptures there were by Polish-Belgian visual artist Albert Szukalski. His depiction of the Last Supper set against the Nevada desert quite amazing. His effect of ‘shrouded ghosts’ was accomplished by wrapping live models in plaster-soaked fabric. Even during the week there were a number of other tourists visiting and taking advantage of the smaller crowds to get some great photos. Another of our favoured Nevada spots is Death Valley National Park. Really too hot to visit in the summer months, this park is the hottest, driest, and lowest spot in the U.S. but one of its popular tourist spot still suffered damages during last October’s torrential rain storms and flooding. Sadly, we were unable to visit Scotty’s Castle on this vacation and I hear it won’t likely reopen until 2019. But there was still lots to see as we traveled on roads where 20-mule-teams once trundled along carrying their loads of borax from near-by mines and visited the remains of the Harmony Borax Works. Another drive into the desert was our visit to the China Date Ranch. Story has it that a Chinese man named Quon Sing (or Ah Foo) developed the water and planted fruits and vegetables in this canyon by the Amargosa River. Instead of working in the Death Valley borax mines as he had for years, he became a businessman and sold his produce to the mining camps. The story goes on to say that a man named Morrison ran Quon Sing off of his own land at gunpoint around 1900 but people still referred to the property at Chinaman’s Ranch. The date grove was planted by the youngest daughter of one of the later owners in 1920 and has expanded to what it is today, a delightful oasis in the desert. We stocked up on fresh dates and enjoyed a date shake before heading out on the road to enjoy more of the beautiful scenery. We made sure to stop in at the Clark County Museum. They change the displays in their homes on Heritage Street by the seasons so I was hoping they might already have their Christmas decorations up. It turns out we were a bit early this year but they were done up for Thanksgiving. It’s really neat to see the differences in the houses through the different decades plus, I have to admit, I just plain enjoy visiting period homes. This is just a glimpse some of the many places we visited during our stay. There were a bunch more including, Red Rock Canyon, The Morman Fort, and Springs Preserve among them. And I can say with certainty, we’re already making plans for another visit!